A couple of weeks ago Sebastiaan started high school. New school, new teachers, new kids, new rules and about ten times as much homework. A big change for him (though he does not seem to worry about anything – not about having to make new friends and not in the least about his homework) and for us. A lot of our social contacts in the past years came through school and some parents of our kids’ classmates have become good friends. The night we cycled to the school for the first parent-teacher conference of the year, I mused how weird it will be not to know any of the parents this time. It turned out there was no reason to worry: we knew about half of them. There was the lady who has a paint store around the corner, our ex-neighbours who moved away some eight years ago just as Sebastiaan and their son were starting to play together, the best friend of Remco’s high school dance partner, the former deputy mayor whose other son is in Esther’s class… And, most surprisingly, a couple that we already are friends with and whose daughter Sebastiaan has known for about 8 years but forgot to mention now goes in the same class. It seemed we had some kind of connection to almost everybody in the room which once again proves as Remco likes to say that “Hengelo is a village”. Or is the whole world ultimately a village? Meanwhile Esther (a seasoned high school veteran) enters her fourth year and to reconnect with her friends after the summer holidays she invited them over to our house for a lunch of fruit filled dumplings, her favorite dish and guess who got to make them? This is one of the classics of the Czech cuisine and while, despite my Bohemian heritage, I do not really make many Czech dishes at home, this one I like. It’s a sort of semi-legitimate dessert-for-dinner situation. Sometimes the fruit dumplings are made with a kind of cottage cheese dough, but I prefer this much lighter tasting version with yeasted dough. The fruit is steamed in the dumpling with all the juices trapped inside. And then to serve you put cottage cheese and some sugar on top and douse them with melted butter which together with the fruit juices makes a delectable instant sauce. The most important thing is to seal the dough well so that the fruit juices cannot escape (though it is not the end of the world if some do). It is also a job that kids love to “help” with and last summer when I was making blueberry dumplings I got the help from both my kids and my sister’s kids (then aged 2 and 4). Which got a little overwhelming but I stuck to my rule “let children help whenever they want to” because I believe that if you keep refusing them because you think they are too small and it’s all too much hassle and too big a mess, by the time you deem them big enough to help, they won’t be interested. 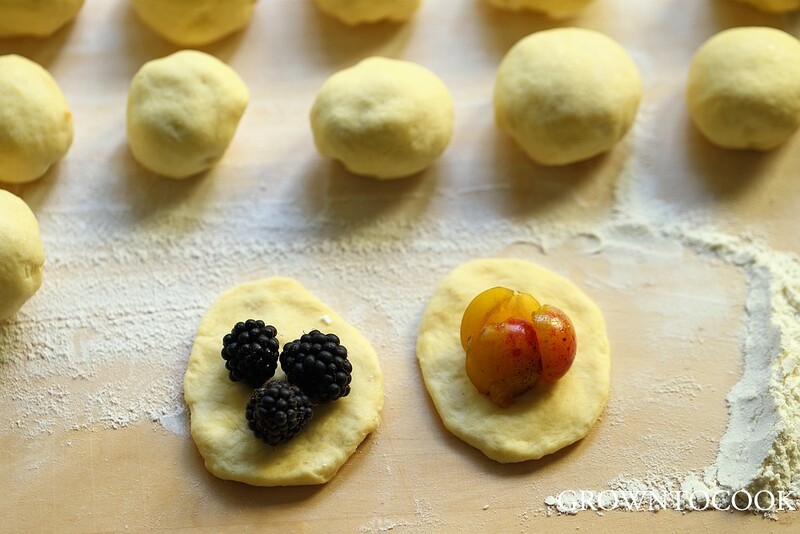 Many kinds of fruit make for delicious dumplings and many seasonal variations are possible: you can make them at the beginning of summer with strawberries, or a little later with apricots, then with blueberries and in the fall with plums. This was the first time I tried using blackberries and that was delicious, too. Out of season, even frozen fruit can be used. To make the dough, mix flour with salt and sugar in a large bowl. Make a well in the center and pour in the warm milk in which you have dissolved the yeast. Let it stand for about 10 minutes, or until the yeast bubbles up. Add the melted butter and the egg yolk and mix everything together. If the dough is too sticky to mix by hand, use a wooden spoon to beat it until it becomes smooth and springy to the touch. Cover the bowl with a clean tea towel and set aside to rise in a warm, draught free room, until it doubles in size. This takes about an hour or longer, depending on the room temperature. Take about a tablespoon of the dough and flatten it into an oval shape. Put the fruit of your choice in the middle. Larger fruits such as plums and apricots can be used whole, of berries you should use about a spoonful. Add a little sugar if desired and pinch the dough together to form a dumpling. It is important to seal the fruit inside so that no juices will escape. Turn the dumpling upside down and put it on a floured surface to rise. In a large pan, bring water to boil. Turn the heat down to a gentle simmer and put in about 5 dumplings at a time. Cover and boil about 5 – 8 minutes, depending on size. Take the dumplings out and let dry a little in a colander. 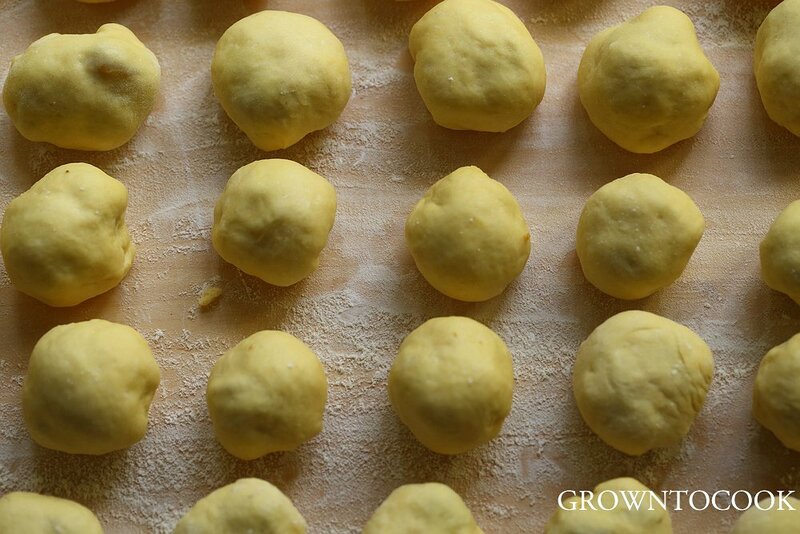 If you have a steamer, you can also stem the dumplings instead. I use a stainless steamer basket that I oil well to stop the dumplings from sticking. Serve warm with cottage cheese, melted butter and sugar to taste. oh my goodness, these look delicious! Strawberries are just coming in here, but I think I will wait for cherries to make these. They taste great with just about any fruit 🙂 I hope you’ll like them as much as we do! They look delicious. Glad to hear that the start of high school has gone well. I think that it’s sometimes the parents who feel more daunted at new experiences our children are undertaking than they do. The potato dough is good, too, I should make it sometime! But I hope you will like the yeasted dough as well! This looks delicious! Can’t wait to try it with the last cultivation of our “seasonal” fruit still growing here in Canada! Thank you, Marianne! Almost any fruit can be used and they are always delicious.